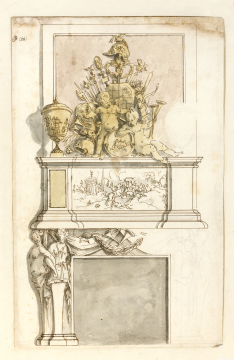 Design for a chimney-piece with a large martial relief of putti and arms in the overmantel, a central pedestal frieze with a relief of a Roman battle scene, and a fire surround carved with caryatids, herm figures, drapery and trumpets. You are here: CollectionsOnline /  Design for a chimney-piece with a large martial relief of putti and arms in the overmantel, a central pedestal frieze with a relief of a Roman battle scene, and a fire surround carved with caryatids, herm figures, drapery and trumpets. Early trimming of the sheet to remove damp-stained paper reduced the sheet to below the top of the room cornice. A location in one of the principal rooms is suggested by the martial and monumental character of the design. The fire opening would have been at least 5 feet wide and the chimney breast at least 8 feet. The entire carved fire surround and heavy relief panel framed by pedestals would have been in marble; the martial trophy, putti and vases would have been in plain limewood. Gibbons or Cibber – both engaged at Hampton Court in the carving of pediment reliefs in 1694 – could have undertaken this work, but the cost in materials and workmanship would have run to several hundred pounds. The overmantel relief depicts a classical battle scene, with a circular temple and funerary obelisk in the background. The Roman martial trophies in the overmantel display bear the images of modern Stuart Britain: the royal arms on the central shield, St George on the disc between the putti, and the Garter star on a shield behind the left putto. The martial theme is reinforced by the use of caryatids and herm figures in the fire surround. Bearing up the massive pedestal, they are suggestive of captives from the battle depicted in the relief panel.Drawings 110/42 and 110/46 may be preparatory for this design, or derived from it (6/3/4 and 5).